Could someone explain to me how I would go about finding out about a reactive object's dependencies (i.e. listing their names and environments, actually accessing them, etc.) that have been automatically inferred by shiny::reactive()? More specifically, I'd like to use that information in my custom "one-stop-shop" function setShinyReactive (package reactr) that builds on top of shiny functionality. But I'm still kind of lost regarding the actual details on this. You can find my forked version of shiny that I used for my reverse engineering efforts here. This .Rnw file represents my current status of knowledge and questions about the actual implementation. The reason I'd like to be able to do that is that I'd like to be able to specify bi-directional reactive bindings via original (or only slightly adapted) shiny functionality (for examples see this README). This is only the case for bi-directional reactive objects as they are sort of "hybrids": both reactive conductors and reactive sources at the same time. For my other, sort of "pedestrian", take on reactivity based on setReactive, I queried bi-directional dependencies via method .hasBidirectional. That's the information that I'd like to retrieve from the correct shiny instance/class that actually holds this information somewhere. Browse other questions tagged r reverse-engineering shiny reactive-programming or ask your own question. In a given reactive, is there a method/option to get the reactive element(s) that triggered it? 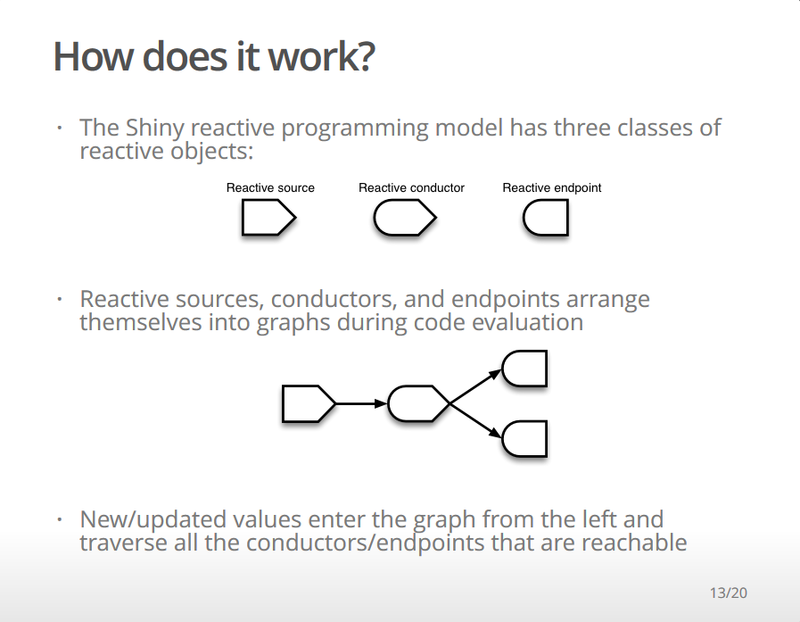 Shiny - Are reactive environments possible?